We all have that one friend or family member who is constantly trying new diets. And honestly, they make eating miserable. You can’t go to just any restaurant, fast food is out of the question, and planning for meals is a bigger ordeal than it needs to be. And every diet they try has different restrictions, allowing them to eat certain foods, avoid others, and limiting the amount of food they are allowed to eat. Then there are the people who don’t care about diets—food is good, food should be enjoyed, and no one can tell them what to eat or how much to eat. These are the people who belong in buffets. An endless pile of happiness, waiting to be scooped onto their plates. While these two types of people often do not eat together, sometimes they end up being married to each other, being roommates, or just getting lunch together during their break. And it is in these moments of deciding where and what to eat, that feuds are born. Health vs. a love for food is never a good battle, and someone always loses. It doesn’t have to be that way! Baba Ghannouj Mediterranean Buffet can change this lunch time fight for good. If your health freak of a friend knows anything about diets, they should know about The Mediterranean Diet. 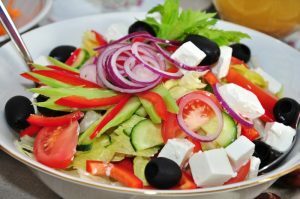 The Mediterranean Diet is obviously based on Mediterranean foods, which include chickpeas, olive oil, nuts, fruits and veggies, eggs, poultry, and fish, among many other things. Sounds healthy right? But Mediterranean food also offers more than just the healthy, diet approved stuff. And that is where we come in. At Baba Ghannouj Buffet, we offer the healthy and delicious food for everyone to enjoy. Yes, it is true. Even the health nuts can enjoy a delicious meal that sticks in their diet restrictions. First we have our selection of salads. Salads that make you questions whether they are actually healthy, just like the infamous taco salad. Our salads include a lot of veggies and many of them have dressing that is basically olive oil and spices. Enjoy a tabbouleh salad along with our chickpea hot dish. Or pair a hummus and pita plate with a fattoush salad. Our menu is full of items that you could find in your short list of diet accepted foods. And even if you can’t, everyone deserves a cheat day every once in awhile, right? Now, this is not implying that the healthy selection and not also delicious, or that the delicious items could not also be healthy. But there are some of our favorite menu items. So, if you don’t care about diets, go ahead and load up! Buffets are great for that reason! One word—gyros. 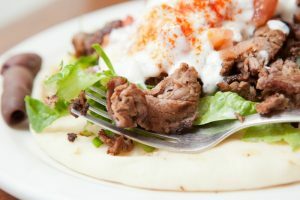 The greek food trend that has been sweeping the nation, a delicious pile of meat, safely tucked inside a soft pita bread, drizzled with tahini sauce, and accompanied by different veggies. That right there, is an American staple when it comes to Mediterranean food, and we offer many different gyros to choose from. Choose wisely. Or don’t! Buffets are buffets for a reason, right? Try different gyros, switch it up with some falafel or kebabs! The choices are endless but always delicious! Next time you are with your health nut buddy, suggest something you both with love, suggest Baba Ghannouj Mediterranean Buffet! You can even get your favorite Mediterranean foods delivered! Come in today or contact us to order!